W.A.L.T. : Using clues in text, along with prior knowledge to help understanding of specific vocabulary and comprehension. Sock puppets are really fun to make. 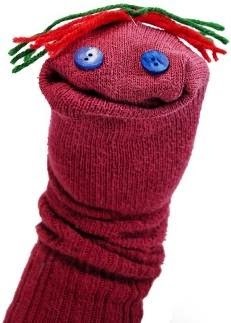 What you need to make a sock puppet is at least one sock that can fit your hand inside and can cover half of your hand, string, 2 googly eyes and a glue gun. Make sure you put them all in a shoe box and write your name. Then use a glue gun to glue the 2 googly eyes to the top bit where you put your toes in the sock and glue it on to there. Then use the glue gun again to glue on strips of strings on top of the googly eyes for the hair. Then you can add any other accessories to it to make it look stunning and there you go your very own sock puppet.